The year was 1987. For many months, Terry and Jack had talked about opening a watch repair shop close to home, but never took that step until the fall of that year when events coalesced to make that happen. Terry was working as an RN and Jack was repairing watches at homes for several Boston area jewelry stores. First, during the summer Terry had a back injury which prevented her from continuing as an ICU nurse. Next, Lucy’s Pet Pantry in Stoneham Square closed and left a vacant store front at 352B Main Street. Finally, Uncle Harry retired from the GE plant in Lynn. Jack and Terry decided to take the big step and open their own business. They signed a lease on the store and began their business education classes. A pet shop, they soon learned, is not a clean business. The store was filthy and the front door fell off the hinges the first time they opened it after signing the lease in October a few days before the worst stock market crash since 1929. Jack and Uncle Harry worked for over a month rehabbing the store to make it presentable. Uncle Harry’s workday began at 7 each morning and he made certain Jack’s did too. They worked each day until about 5 in the afternoon cleaning, hanging new doors, installing paneling, and ceiling tiles as well as ridding the store of roaches. Uncle Harry went home each evening while Jack continued repairing watches at home until midnight. Then the real education began. Small businesses have a high failure rate, so the landlord demanded the rent 3 months in advance. The phone and electric companies required massive deposits to provide service and every supplier had to have all deliveries paid by cash. Somehow, Jack and Uncle Harry got the store cleaned up and ready to open on Black Friday, November 27, 1987 for less than $3000 and that included a used safe for customer’s repairs. Then continuing education began. Expecting a flood of customers, The Watchmaker took in $15 that first day. Ethel Bemis, a neighbor stopped in to ask what we thought we were doing. Jack told her he would be repairing watches and she told him he would be gone in six months since no one ever survived in that store and she lived nearby for over 40 years. Jack assured her he expected to be there many years and within a few months Jack and Terry became friends with Ethel. George O’Brien, a retired Stoneham police officer stopped in frequently to share stories about the old days in Stoneham and have his Bulova watch repaired. Al Raifman was another early customer who brought in his Accutron along with sagacious business counsel. Jack continued repairing watches for jewelry stores, but that gradually phased out as business at The Watchmaker steadily increased each year. In 1994 it became apparent that the building at 352B Main Street would be demolished as part of a Main Street renewal project. The Watchmaker moved to its current location in April 1995 in anticipation of that demolition. 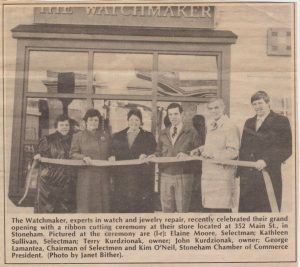 Dave Kurdzionak, Terry and Jack’s son, began working at The Watchmaker while in high school and continued there while attending Plymouth State University in NH. Dave’s involvement was to only be temporary until he got a real job after college graduation. Twenty years have passed since graduation and Dave still works at The Watchmaker. Jack and Terry have now retired and Dave now owns and operates the business until he gets that real job.